Entities with land management responsibility over the watershed include: State Department of Parks and Recreation; California Department of Fish and Game; Golden Gate Bridge and Transportation District; Marin Municipal Water District; Marin Community College District; Marin County Open Space District; and Marin County Parks Department. There are several public school districts that enjoy considerable freedom from local jurisdiction, although they are expected to follow state and federal regulations protecting natural resources and air and water quality. Open Space or Resource Protection: Marin Municipal Water District manages a significant part of the upper reaches of the southern and western sides of the watershed. 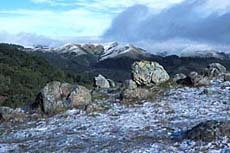 All or part of eight Open Space Preserves managed by the Marin County Open Space District are in the watershed; these areas are also in the upper reaches of the watershed. Sorich Ranch Park is managed by the Town of San Anselmo. A small part of Mount Tamalpais State Park is within the watershed. 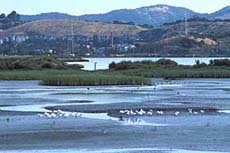 The California Department of Fish and Game manages the Corte Madera Ecological Reserve, located south of the Ferry Terminal along San Francisco Bay. Developed Parks: Creekside Park, including the multi-use path along the creek, is a county park located in Kentfield; the path reaches from the Ferry Terminal into the Town of Ross. Deer Park in Fairfax is also a county park. Local communities maintain several parks within the watershed, nearly all of which are along creeks: Peri Park in Fairfax; Faude, San Anselmo Memorial, Creek, and Robson-Harrington parks in San Anselmo; Ross Common; Piper, Dolliver, Magnolia, Hamilton, Bon Air Landing, Niven, and Remillard parks in Larkspur; and Town, San Clemente, and Granada parks in Corte Madera. Schools: Three high schools and numerous middle schools and elementary schools are near streams. Corte Madera Creek passes through the College of Marin Kentfield campus. Public schools are not under local planning jurisdiction. Suburban Development: Private property is under the jurisdiction of the incorporated communities of Corte Madera, Fairfax, Larkspur, Ross, and San Anselmo or the County of Marin. Urban Development: This is a mixture of private and public property and includes residential and commercial uses. Regulatory authority for biological resources is held by the California Department of Fish and Game and three federal agencies: U.S. Army Corps of Engineers, U.S. Fish and Wildlife Service, and NOAA Fisheries. Agencies dealing with water resources include the Environmental Protection Agency, California Environmental Protection Agency, and California Water Resources Control Board (both the Division of Water Rights and the Regional Water Quality Control Board). Some kinds of activities may involve the San Francisco Bay Conservation and Development Commission and/or the State Lands Commission. The State Department of Water Resources Division of Dam Safety has jurisdiction over repairs or changes to the dam at Phoenix Lake. Regulations that apply state-wide and that are implemented by state and federal agencies include the Clean Water Act, the federal Endangered Species Act, the California Endangered Species Act, and the California Native Plant Protection Act. Marin County and each of the incorporated communities within the watershed have some planning and land use tools that can be used to protect the integrity of the watershed. They may include such things as setbacks for development along drainages, policies for the protection of large trees, or other measures implemented at the discretion of local jurisdictions. Jurisdictions with land use and planning authority within the watershed include the State of California, Marin County, and the incorporated communities of Corte Madera, Fairfax, Larkspur, Ross, and San Anselmo.